Part of the attraction of timber is the woodgrain pattern. This is a natural pattern that is similar but never identical across multiple pieces of timber. Stains and other treatments can enhance the look of natural grain. The way a piece of wood is cut from the tree trunk will significantly affect the appearance of the grain. Wood that will be used for decorative purposes, that will have the grain on display, will be cut in a way that optimizes the grain even as it wastes some wood material. Other cheaper cuts of wood, which will be painted or covered by carpet, are cut from the tree in a more economical way because the woodgrain finish is less important. This cuts a tree trunk from the outer rim towards the centre. This gets a consistent and attractive grain pattern from each plank. But some wood is between the planks is wasted. These planks will be of optimal strength or this type of timber. This cuts a tree trunk in parallel planks from top to bottom. This type of cut will waste very little wood, but the grain pattern will vary in shape and quality. Any plank cut through the centre of the tree will have good grain pattern. These planks will vary a little in strength, depending if the cut was made through the centre of the tree or along the top or bottom. 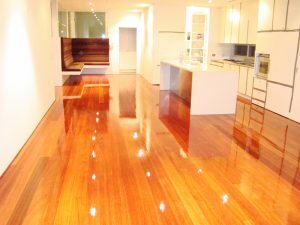 You can have your timber floors re-sanded, and have them looking like new. Some homeowners like to install a subfloor over the main floor, with acoustic underlay between these two floor layers. Acoustic underlay has several advantages. As the name implies it will dampen noise inside a room. The sound of people walking on the floor is greatly reduced. It will also greatly reduce any sound traveling to adjacent rooms, especially rooms below the floor. Acoustic underlay is ideal for apartments and strata as people downstairs will not be disturbed by the people in the rooms upstairs. Acoustic underlay absorbs most vibration and noise. Acoustic underlay also provides a soft walking experience. This is not the same as carpets or rugs, but it is much softer than conventional wooden flooring. This reduces the impact when walking. If you find you get sore feet or sore leg joints from constant walking on concrete, tiles or hardwood floors then acoustic underlay will help alleviate the problem. An advantageous side effect of acoustic insulation is that it also works as thermal insulation. Some people install thermal underlay for insulation to help keep temperatures stable in a room. Acoustic underlay will also provide quite good thermal insulation. This means the room stays warm when you use heating, and the room stays cool when you use air conditioning, all with less energy and effort. These is far less heat transfer to the outside environment. Underlay of all types, including acoustic underlay, greatly reduces dust from getting into the room. 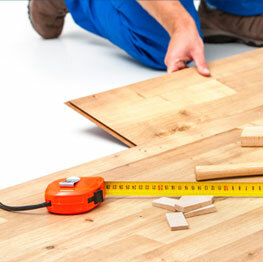 Floor sanding will restore a hardwood floor to its original new appearance. Some homes are heated with electrical wiring or water pipes beneath the floor boards. This principle of hydronic heating (hot water pipe) under the floor is quite old. The Romans used it centuries ago, and it has remained popular in Korea and some parts of upper Europe. In Australia it has only recently started to appear. Underfloor heating has some advantages over other heating methods. It is fairly efficient because little of the rising heat is lost through the roof. It also feels quite natural to the occupants of the building, as if it is simply warmer weather. Unlike air conditioning hydronic heating does not move air. So there are no drafts and there is no noise. The lack of drafts reduces the spread of germs. Perhaps the best advantage of underfloor heating is the lack of hot surfaces, which means there is no chance of anybody burning themselves. The heat is evenly spread through the room. Solid timber and engineered floors are quite well suited to underfloor heating. The Floorboards will not contract or expand much with the changing temperatures. As long as conditions have stable humidity the floorboards should be fine. Harwood timber floors that have suffered surface scratching can be re-sanded, giving them a new top surface. This can be re-stained, polished or lime washed to provide the right look for your new floor. Advise the re-sanding group if there is a heating system under the floor. Floor Sanders Sydney wide are often concerned with the durability of the flooring material. Of course hardwood is always one of the most durable options, but as well as the variation between different species of timber these are other factors that affect the durability of the floor. The hardness of the specific type of timber is measured by the Janka Number. This is a measure of how much force (in Kilo Newtons) in needed to dent the wood. A Janka number of 6 Kilo Newtons is reasonable. 12 kilo Newtons is very good. 16 is extremely hard wood. The floor colour is usually chosen to suit the design décor. But lighter floors tend to hide shallow scratches a little better than dark wood. Floors that do not have a surface stain will not suffer obvious marks if that surface stain is scratched off. But a scratch on a stained floor can often be covered up by applying more of the original stain. A protective finish is good for protecting a floor against surface damage. Water based polyurethane is popular for this – it is water resistant, flame retardant and quite hard wearing. Polyurethane providing a protective finish over a timber with a high Janka number is probably the most resilient type of flooring. A glossy floor tends to show any imperfections, including scratches. By contrast a matt finish reflects less light, so imperfections are less obvious. Hard timber floors last for decades. If they suffer surface wear they can be re-sanded, effectively giving them a new appearance. Talk to us about restoring your hardwood timber floors with re-sanding and polishing. A good quality protective coating can help the surface of a wooden floor last many years. This can both protect the surface from scratching, and provides a fair degree of water resistance. Polyurethanes were developed in Germany in the late 1930s, but did not become commercial available till the late 1950s. As well as being the basis for many hard plastic products and foam polyurethane proved a very resilient coatings for wooden surfaces. 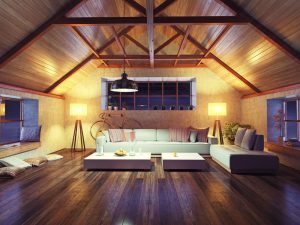 Polyurethane coatings provide a hard glossy surface for wooden floors. There are two main variations for polyurethane, water-based and solvent-based. This is an absolutely clear finish. It is hard to see the difference between the coated and uncoated timber surface, but the texture changes and the coating provided protection to the wood. Water based polyurethane is very fast drying, needing only 2 hours for a re-coat. This means a floor can be given4 coatings in a day, which is the recommended number for this type of floor finish. Water based polyurethane is low odour and moderately priced. Brushed and equipment can be cleaned with water as long as the finish hasn’t dried. This has a slightly tinted, slightly amber look. Many find this tint looks very appealing on timber floors. Over the space of several years the coating will darken slightly, especially in strong light. This will not affect the strength of the finish. Solvent based polyurethane is slower drying than water based equivalents. It takes about 5 hours before the floor can be recoated. But floors generally only need 2 or 3 coats. Equipment used with Solvent based polyurethane must be cleaned with turps / spirits. Wooden floors last for decades, but their surfaces are prone to scratching and superficial damage. Protective finishes on the floor surface can significantly reduce the amount of damage sustained and allow preserve the appearance for many years. If your timber floors do show signs of surface damage they can be bought to virtually new appearance with floor sanding. Other wooden damage can also be repaired. To make sure you are getting the most out of a service you should know the right questions to ask. What sort of environmentally friendly coatings do you use? One great advantage of hardwood (or Bamboo) is the reduced impact on the environment. As long as we are growing more wood (as trees) we are pulling some CO2 out of the atmosphere. But chemicals used to treat the wood, or to provide protective coatings, is another matter. These stains and protective coatings may contain volatile Organic Chemicals (VOCs), and these can either be bad for the environment or bad for our health. Ask for VOC free products. There can be a difference between the expectation and the actual finished product. Accurate computer modelling can give a good impression of what to expect, and you might want to make a few adjustments in light of this information. Do you live on the second floor? Are the people downstairs going to be bothered whenever you walk on the wooden floor? Consider a subfloor and floating floor. Pets can scratch floors because of their hard claws. Trimming the claws is one solution. Else, floors can be given a protective coating. Laminate floors can be rated AC4 or AC5 for harder protective finishes. 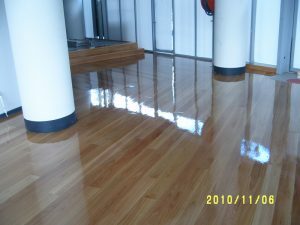 If you need floor sanding Sydney wide then talk to us. Restore your hardwood floors, and look at protective coatings, wood stains and finishes. Ask us for advice. Homeowners may decide to renovate their house and property at some point. This can entail many alterations. Wall painting is probably the most common task, but furniture, kick-knacks, carpeting and many other elements of a home may also be changed. Wooden floors can be re-sanded as part of home renovations. Re-sanding of the floor basically returns it to a new appearance. Only a thin layer of surface wood is removed. The resulting floor is bare timber than can be re-stained and re-finished in many different manners. The floor can have the original look restored, or be coloured in a completely different way. Many clients will include a repainting of the trim (skirting boards) when the floor is re-sanded. Some instruction on this can proves useful. Put plastic and / or cloth groundsheets on the floor, to avoid any dripping paint. Use painters tape along the floor where the floor meets the trim, to avoid any paint getting on the floor. Apply paint lightly with strokes in one direction. Start painting a dry area and work towards an area already painted. Keep painted areas in a zig zag or random pattern; straight lines are too easy to see. A short, stubby brush might help in tight areas like corners. Good hardwood can last for over a century. Hardwood timber floors can re-sanded to restore their ‘just installed’ look. 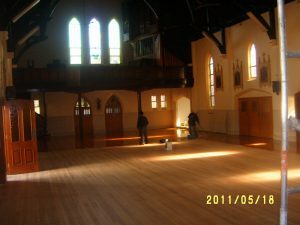 If you are renovating, or if you just want the hardwood floors to look like new, consider having the floors re-sanded. 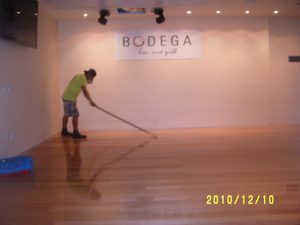 Floor Sanding Sydney – After floods. Water damage is one of the few legitimate threats to hardwood floors. All the worse because flooding is often not covered by most insurance policies. Wooden floors suffering some small scale water damage can often be repaired, though it depends on the extent of the damage and the type of water. Though clean water flooding is very inconvenient the floor can often be recovered. Wood will quickly soak up water when flooded, and this water is slow and difficult to remove. If the surface water is quickly drained away the remaining water, which has soaked into the timber surface, can be removed with absorbent material and air circulating fans. 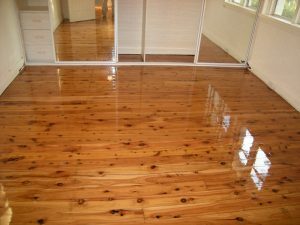 If the water that is soaked into the wooden floor is left to long there will be problems with mould, mildew and fungus. Once this has set in the floor is irreparably damaged, and the room will probably cause health problems. If the floor can be dried in time, so that there is no mould or mildew, it can be restored. But the water will probably have caused swelling and buckling in the floor surface, making the whole floor uneven. 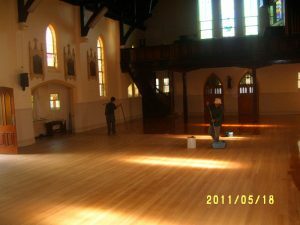 Re-sanding can restore a wooden floor to virtually new condition, removing the uneven surface left by clean flood water. Grey water is liquid from sinks, dishwashers, bathtubs, washing machines, fish tanks and other similar sources. It tends to by unhygienic, and any damage from these is a possible health hazard. Wooden floors that have been flooded with grey water will probably need to be replaced. All carpeting and furnishing infected with grey water will need to be disposed of. Grey water can be used to water gardens, but has no other use. This is water from sewage, or water for large scale floods that has contacted the ground outside. It is an extreme health hazard. Any floors in contact with black water will need to be replaced or decontaminated. This requires expert advice and treatment. Black water must be avoided. It has no practical use. Hardwood floors affected by clean flooding can often be restored with re-sanding.